I have this habit of taking pictures of my clients' pets. Do any of you other designers do that? Pets seem to distract the heck out of me on site visits. I just cannot stop myself from petting and playing with them. It doesn't really matter what kind of pet it is (wellll....anything with fur) ...cats, dogs, Burros, Llamas, rabbits....I was just petting some guinea pigs today. I have had cats, fish, a rat, dogs, rabbits, guinea pigs, mice, and a parakeet over my lifetime. If my parents would have seen fit to get me a horse, I would have had one of them too.....but that is a whole other story. Now we are down to one dog (our fine old gent of a dog passed away a couple of months ago) ...and two grand pups who visit as often as I can get them. I have always been intrigued by how others live with their pets...where the food bowls are, the toys, the beds, what kind of fabrics work best for their pets (especially cats!) I have accommodated these things in many a client home and have collected lots of resources to make the homes of my clients and their pets as fun, cozy and efficient as possible. So here is a little book that came along and made my life a little bit easier.....and more fun! Of course I always like to see what's up in any new design book, but this one takes it to a new level....Designers AND pets, and how they manage. 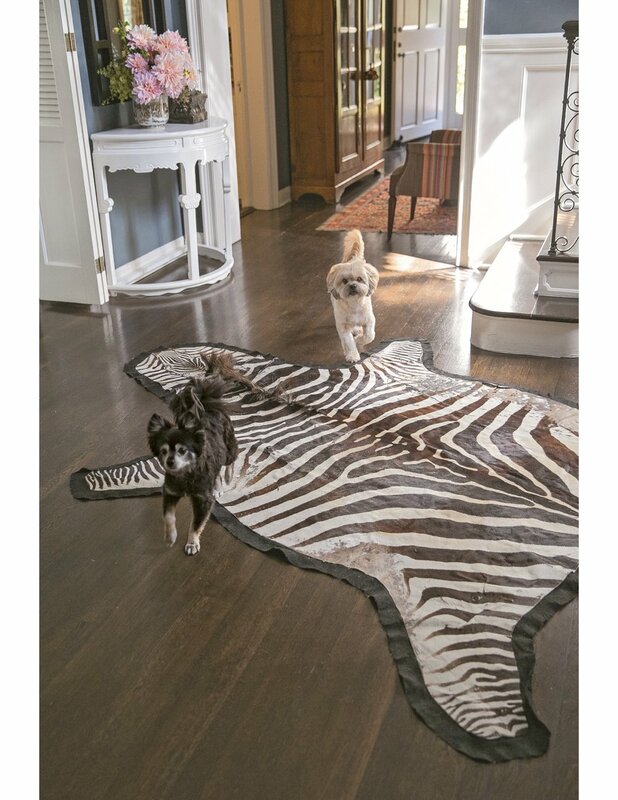 In this charmer of a book, At Home with Dogs and their Designers, Susanna Salk takes us inside some of the most beautiful homes of the most sought after designers in the country, interviewing them about how they live with their dogs. Some of the designers include Jonathan Adler, Martyn Lawrence Bullard, Bunny Williams, Betsy Burnham, Steven Gambrel, another blogger friend Brooke Giannetti, Mary McDonald, Charlotte Moss, Kelly Wearstler and a bunch more! DAISY OLYMPIA GREEN IS THE FREIND OF MARTYN LAWRENCE BULLARD....ALSO KNWN AS D.O.G. FOR SHORT! 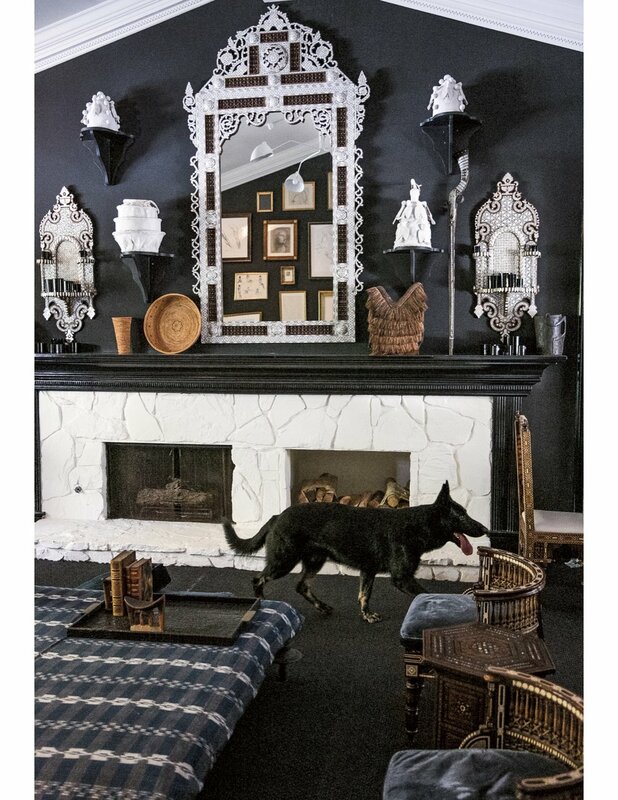 WINDSOR SMITH'S DOG, SUR, IS A PERFECT MATCH FOR THIS HOME! NAMED FOR THE BEAUTIFUL BIG SUR ON THE CALIFORNIA COAST. I found it very endearing that most all of the designers mentioned that their pets have free reign of the house. Even if the designers are intolerant of messes or disorder as a general rule, they turn a blind eye when it comes to these fur babies. At Home with Dogs and their Designers by Susanna Salk is published by Rizzoli, New York, 2017 (who is always so kind to send me books to show to you all and give my two cents). It is a perfect little helper and resource book. It divided into sections by designer. Each designer talks about their furry friend(s) and gives tips on the care and feeding of such friends. We get to see the designers and digs at home in their natural habitat. All of the photos are by Stacey Bewkes. You may know her by her fabulous lifestyle blog, Quintessence! This is one of the many reasons the blog is so well loved....the photos are amazing! Near the end of the book, there is a section about how each dog found their very own designer, their favorite place they are not supposed to be, favorite meal, favorite restaurant, most trouble they ever got into, guilty pleasure, special talent, favorite walk, and pet peeve. Some of the answers are hilarious, and all of them will make your heart melt. At the VERY end of the book, there is a fantastic list of resources for information about all kinds of things, from cleaning up messes, to traveling, to doggie furniture. And there is last, but not least, a list of organizations that serve our faithful friends. I hope you find it in your hearts to contribute to one or more! One thing is certain. This book illustrates how much designers love their dogs! And of course, I am no different! Here are a few of my favorite photos of my own sweethearts! I hope you enjoy and I hope you have your own to give a big hug to everyday. They are the best therapy around! 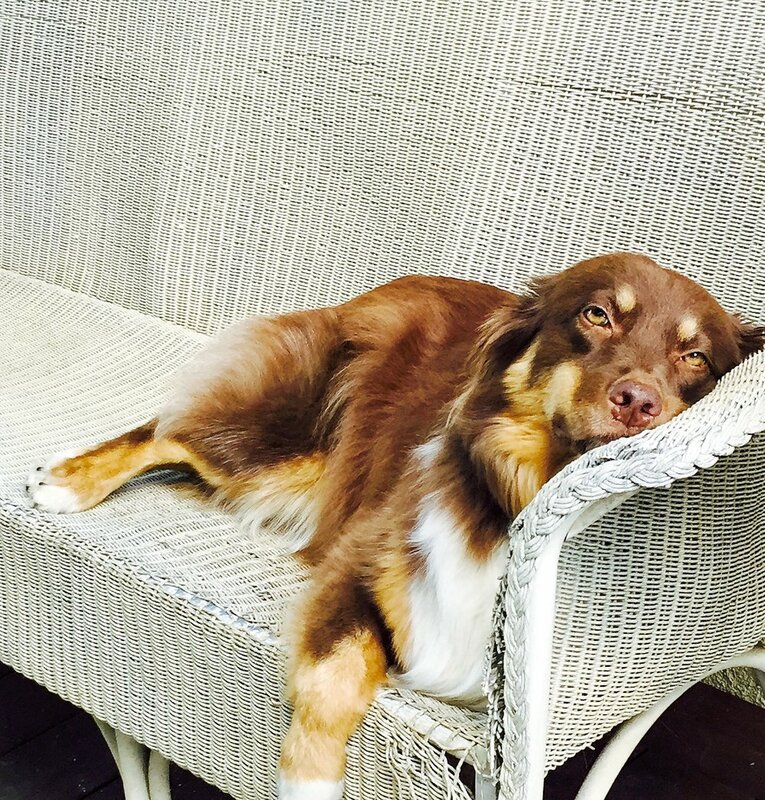 NULLAH IS MY RED TRICOLOR AUSTRALIAN SHEPHERD. SHE LOVES TO CUDDLE, AND INSISTS ON A DAILY MASSAGE, AFTER DINNER TREATS, AND LOVES TO SCRATCH HER BACK BY ROLLING AROUND ON THE SEAGRASS RUG IN THE FAMILY ROOM. 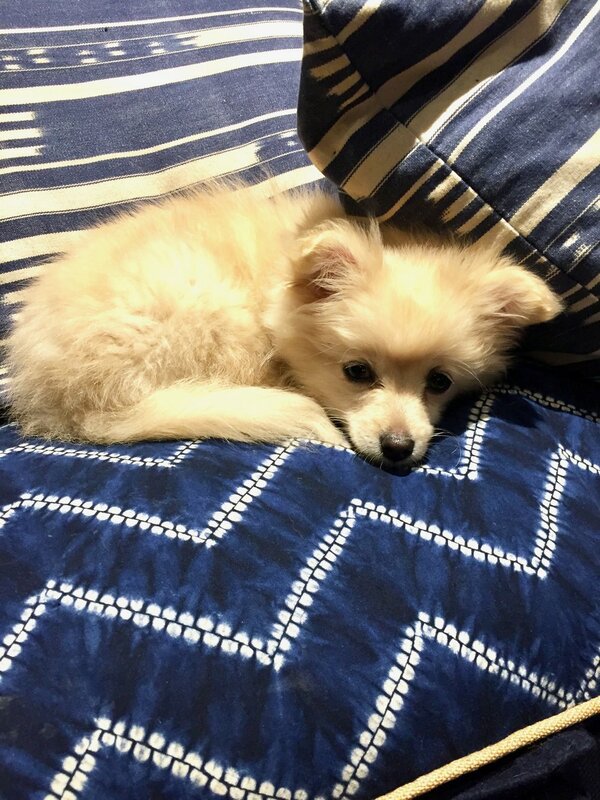 GRAND-PUP, POPPY, IS A RESCUE DOG AND WE THINK SHE IS PART POMERANIAN, MAYBE CHIHUAHUA ? SHE IS A LITTLE BIT SHY, BUT WHEN SHE GETS TO KNOW YOU SHE IS SUCH A LOVE. SHE FINALLY GOT TO B E FRIENDS WITH NULLAH WHO OUTWEIGHS HER BY AT LEAST 60 LBS. AND THEY PLAY TUG-OF-WAR NOW DAILY. NIBBLER IS POPPY'S BROTHER AND FEARLESS! HE INITIATES FRIENDSHIP WITH EVERY DOG AND PERSON HE COMES ACROSS. HE IS MY LITTLE BEAR CUB! 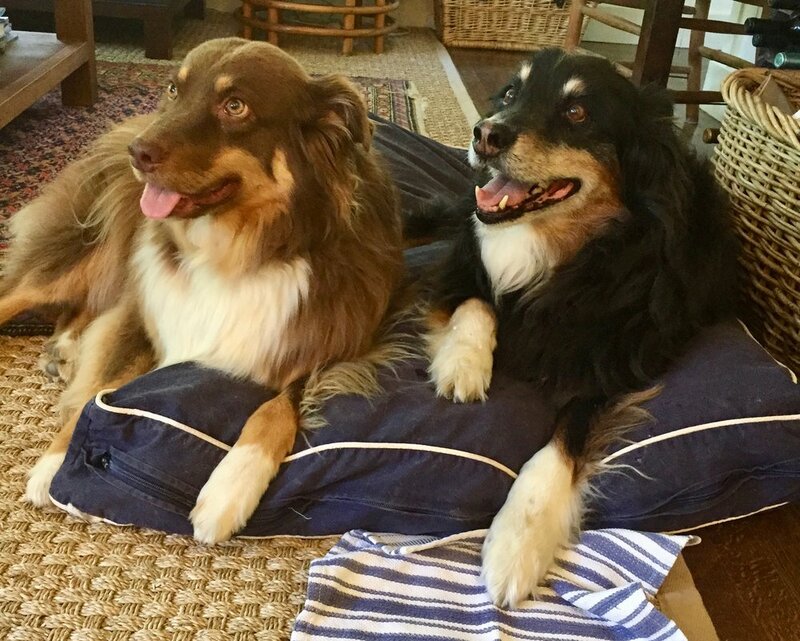 NULLAH AND COOPER WERE OUR PAIR OF AUSSIES UNTIL COOPER PASSED AWAY RECENTLY. COOPER WAS 16. HE LIVED FOR MEALTIME, WALKTIME AND HAVING HIS HEAD SCATCHED EVERY EVENING WHEN WE CAME HOME. DURING HIS LIFE, HE WAS A FRISBEE PLAYER, AGILITY COURSE RUNNER, BACKPACK PARTNER, AND ALL AROUND ATHLETE AND AWESOME COMPANION. HE WAS OUR KIDS' BABYSITTER AND PLAYMATE. HE WAS A GENTLEMAN AND A SCHOLAR. WE MISS HIM VERY MUCH. NULLAH NEVER CEASES TO LOVE US AND KEEP US ENTERTAINED WITH HER ANTICS. WHEN WE WENT TO FIND A COMPANION FOR COOPER , SHE STOLE OUR HEARTS. THE REST OF THE LITTER WAS NOT TOO INTERESTED IN US, BUT SHE BOUNDED INTO OUR LIVES WITH UNSTOPPABLE ENERGY EVEN THOUGH SHE WAS THE RUNT OF THE LITTER. THE BREEDER WAS PLANNING TO KEEP HER, BUT SEEMED TO SENSE NULLAH HAD FOUND HER FOREVER FAMILY AND LET HER GO HOME WITH US. NULLAH KNOWS OUR EVERY EMOTION. IF WE ARE SAD SHE COMES AND LAYS HER HEAD ON OUR SHOULDER UNTIL THE SHADOW PASSES. ALWAYS READY FOR A WALK, PLAYTIME OR A CUDDLE, SHE IS OUR BEST FREIND EVERY DAY. I am thinking this book is kind of the perfect thing for the upcoming Holiday Season......perfect host(ess) gift for those with pets, or those thinking about becoming a pet person....perfect for friends and family....and perfect for the pets to give to their people....and perfect for many of my clients! And there is absolutely nothing wrong with getting a gift for yourself.